My friend Linda has been making a few trips to Arkansas since her grandson is now located there. In one of her trips she stopped at some shop and gave me a call because the proprietor had some discontinued colors of Tattered Angels Glimmer Glaze in stock and Linda thought I might want to try it out. She had to explain to me what it was and I couldn't pass it up. 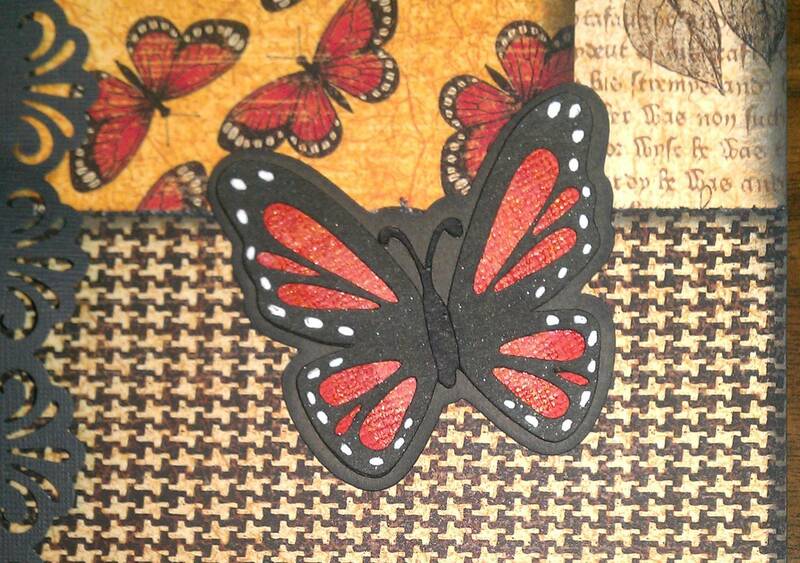 I decided to use it for the first time the other day when doing this butterfly and I think it added a nice touch. The orange on the butterfly is a dark orange and then I pounced my Popcorn Cat Eye Chalk Ink on the insides of the wings and then used a paper towel to blend the ink in a little. After that dried I painted some Mellow Yellow Glimmer Glaze on about 2/3 of the wings. You might need to make the picture bigger to see the detail but I think it came out really nice. The bottle does come with a brush, think of nail polish, but next time I use it I think I will use some of my own brushes for better control. 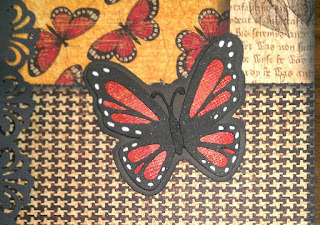 The butterfly was cut using the MTC program and while I don't think it is a Monarch butterfly I think by adding some dots with my white gel pen I made it look close enough for my purposes. The finished product will be posted after my Christmas party so stay tuned! If you would like the MTC file you can download it here --> BUTTERFLIES. The file is set to cut 3 different sizes. If you are MTC user you should know how to split the images and use what you need or re-size. Very pretty. I've really enjoyed the look my homemade glimmer mists add !